The second day of the Champ of Champs was a tough one for Canadian singles player Steve Santana as he came up a against some players firing on all cylnders. Today say Santana have a bye in the second game with games against Swaziland and Malaysia. In the first game it was 9-5, 4-9, and 0-4 in the tie-break. In the last game of the day Canada took on a tough Malaysian player in Hizlee Abd Rais, it was a tight battle with Hizlee coming out on top 9-8, 8-6. Tomorrows action will see Santana play 3 games vs England, Nambia and Botswana. Keep going Stevie as we are all behind you. Day Three and 2 of three games played. Lost a good battle to David from England this morning and a battle against Will from Namibia. Great guys and excellent players. Just was on the outside of the mark, but playing ok. Time to relax and let the bowls roll! Some fantastic battles out here. 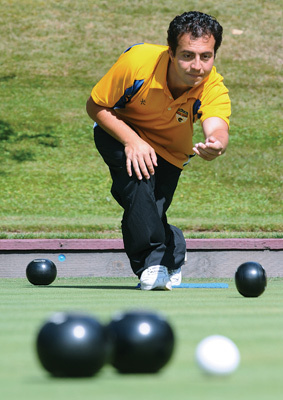 See all the results on the world bowls website! Still many games to go! Everyone having a good time and good bowls to all!